This must be an inspiration from some of the reality shows on TV. 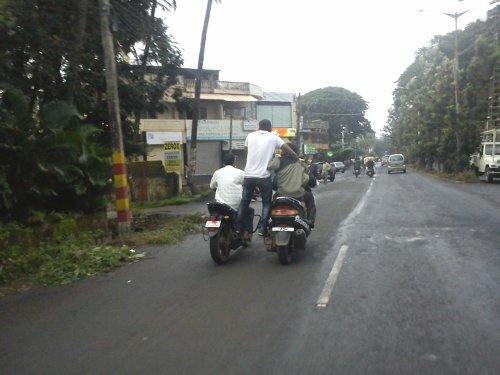 Youths were found doing stunts on their bikes on Congress Road and were spotted by people and who sent us these photos. Photos taken at around 6.30 pm on August 7, 2011 on Congress Road. What do these youths wanna show that they have talent in the middle of the road? What if some accident happens who is responsible? Biggest question why were they doing it on a heavily traffic prone road, did they want to impress someone? Will the police take any action and stop this menace from happening? 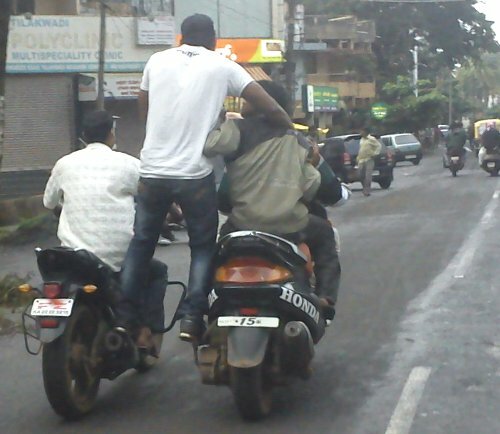 This has to be stopped… Police should take serious actions on such guys! I have been staying opposite to Gogte College of Commerce, Tilakwadi, and have most often seen this kind of crap happening right on the road.. Full road is crowded once the colleges are left, and there is a huge mob of students that are on their way home.. These guys assume the road as if their racing ground and draw their vehicles like crazy.. I have personally seen many accidents happening on this road.. And in mostly all the times, the victim was the normal people walking on the road. We are not born to get hit by somebody this way on a public road.. Special areas like Gogte College Road, Bogarves circle, RPD Cross and mainly the Deshmukh Road and Sai Mandir Area should be monitored by Traffic Police to grab such idiot stuntmen. This needs to be informed to the Concerned Authorities of the Traffic Police for that area and then a post should be made then it will make more sense to the public that yes some action is happening to curb these acts.. Hope it makes sense! Absolutely idiotic .! We don't care what happens to them while doing so… as they suffer for their own doings…But think about the people who are walking/driving on the road who may have to pay for this ruckus !?!!?! Idiots in short, Their parents must be dreaming nice things for them and these immature guys are doing stupid idiotic things risking their lives and other innocents too on a road. cops should book them, courts should fine heavily and warn them, so that they don't do it again.. hope the photographer has noted the number plates!! !